Food sensitivities can include specific food allergies and food intolerances that can be very destructive to the body. Food allergies are a very severe immune reaction to a particular food that causes immediate reactions such as swelling, rash, itchiness and sometimes a life-threatening anaphylactic shock. Food intolerances cause more subtle health challenges that make someone feel uncomfortable without outward immune reactions. Food intolerances can often lead to elevated levels of whole body inflammation that can cause fatigue, joint pain, brain fog, digestive disturbances, headaches and other unwanted symptoms (1). 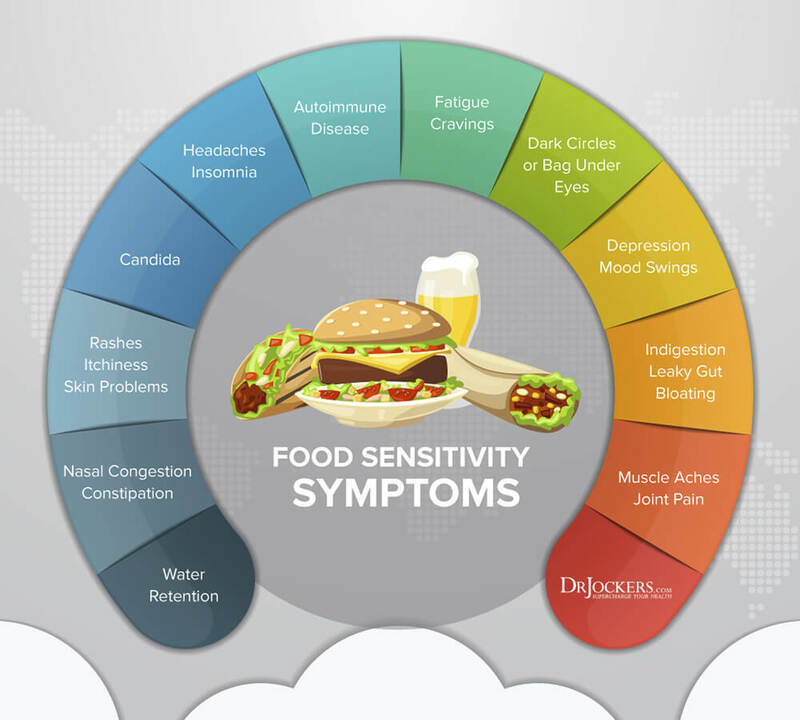 Many people go through their lives without ever understanding how food sensitivities can lead to these health challenges. They never suspect that the food they are eating every day is silently killing them and their doctors never advise them to look at how they are responding to their diet. True food allergies are estimated to affect about 4% of adults and over 5% of children these days. Clinicians and researchers are concerned about the increase in allergies in children over the last 20 years. There has been an 18% increase in food allergies in children since 1997 (2). 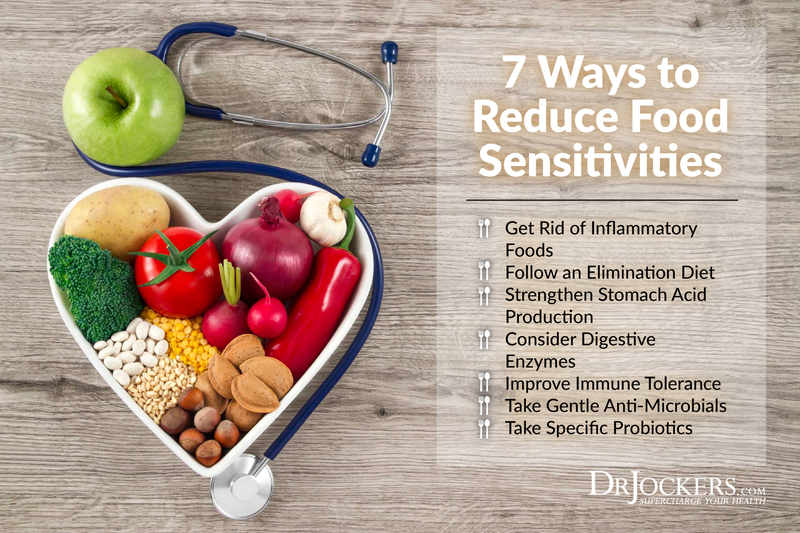 Over 25% of the population has subjectively reported that they have food sensitivities and due much better when they avoid consuming certain foods. It is advisable for people to avoid gluten, unfermented soy, peanuts and pasteurized dairy as the health risks far outweigh any health benefits from these foods. As a clinician, I see so many individuals that have food sensitivities that cause an inflammatory spiral and worsening health. This is primarily caused by damage to dysbiosis or bad balance of microorganisms in the gut and resulting leaky gut syndrome (3, 4). This leads to food particles entering into the circulatory system and the immune system tagging and creating an inflammatory response in reaction this. The body then becomes hard-wired to create inflammation every time we consume a particular food (5, 6). If you have a food intolerance or sensitivity than the food will cause a stress response when you consume it. This is because the body has identified it as a threat to your body and will initiate a mild-moderate immune response when it is consumed. When the body is under stress, it activates the sympathetic branch of the autonomic nervous system. This signals a fight or flight response where the heart rate goes up, the blood pressure goes up, etc. Understanding this fight or flight response, you can use a simple pulse test that uses biofeedback as a free non-invasive test to measure your level of sensitivity. There are number of food sensitivity tests that you can have done as well if you want to spend the money and have something more in-depth. I recommend this one here. The nice thing about the digital pulse oximeter is that you can also look to see big changes in your oxygen concentration which may go down if your body has a stress response to a food challenge. In order to do the free biofeedback test, begin by sitting down and relaxing for a few minutes and then take 3 long deep breaths and afterwards begin testing your resting pulse and get a number. Let’s say it is 60 beats per minute (bpm). Next take 3 long deep breaths again and take the food in question and place it on your tongue and let it sit there for 20 seconds or so and do relaxed breathing and then test your resting pulse again while in the same position. There should be no other variables that would affect your heart rate. Step 7: Check the difference between normal heart rate and food item challenged heart rate. The food elicits no response or just a 1 bpm difference in your heart rate. If you eat a certain food and it does not elicit a change in heart rate you are probably not sensitive to it. However, if you notice that you feel awful every time you eat it…then try avoiding the food and see what you notice instead. This is always a good general rule. The food elicits an increase in your heart rate of 2-3 bpm. Always retest if this happens. The food elicits a heart rate increase of 4+ bpm. Stop and retest. If this happens again the food in question is causing a stress response and you should avoid this food for at least six weeks before trying again. Why do you take long deep breaths before each pulse recording? A: You want to be in a relaxed state and take out as many variables as possible. It is easy to have a stressful thought or to talk or do something that would naturally bring up your heart rate. Taking 3 long-deep breaths helps restart your physiology in a relaxed, parasympathetic dominant state. If you didn’t feel right about the test and felt as though you weren’t fully set for the challenge than, by all means, retest. The key is that you have as much standardization and accuracy as possible when doing the testing. Why do you put the food on your tongue? Why not just eat it? A: Many practitioners do have the individual eat the food. If so, be sure to wait one full minute before retesting pulse. The act of chewing and swallowing can bring up the heart rate and cause a false positive. Additionally, chewing and digesting a food you are sensitive too can cause an increase in inflammation ranging from very mild to very severe. Putting the food on your tongue for a minute and 20 seconds, won’t have quite this effect. I would prefer my clients to avoid this potential inflammatory storm if possible. Once you have identified any major food sensitivities you will want to be sure to avoid these foods. If you continue to consume them they will lead to further destruction of the gut membrane, adrenal burnout and chronic symptoms and accelerated disease development. You may be able to reintroduce some of these foods once your gut is healed and your immune system has calmed down. Begin following the healing diet while avoiding your particular sensitivities and incorporate the intermittent fasting strategies with fermented foods and probiotics to restore tone and balance to the digestive system. I have most of my auto-immune clients begin on an auto-immune diet that eliminates the most common food sensitivities including the list above as well as nightshade vegetables (tomatoes, potatoes, eggplant and bell peppers). I then have them do this pulse test with the other foods they will be consuming from this shopping list until they feel confident that these foods are tolerable. I then have them follow this diet for 30 days and then begin to retest certain foods. As we move into the reintroduction phase, we want to be as intentional as possible adding in new foods in order to understand how our body responds to them. The order of foods you add in can be variable based on your past experiences with each particular food and your personal preferences. If you know you have a sensitivity to a certain food, then do not try reintroducing that food right away. I would focus on the “fringe” foods that you have responded either neutral or well too in the past. This means you should begin by reintroducing foods that you have not linked to any increase in symptoms in your past history. In order to ensure that your body can handle the particular food agent, we are going to do a dual challenge. This includes a pulse challenge and a reintroduction challenge. Phase I: Do a pulse test on the particular food you want to add back to your diet. If you get a negative response to the food, then you may add it back to your diet for the reintroduction challenge. If you get a positive response, then keep the food out of your diet for another 4-6 weeks before retesting. Phase II: Eat the particular food with each meal for one full day and then take 6 days off and go back onto your elimination diet see if you notice any changes during this period. Rank how you are feeling during this period. Example: You want to reintroduce eggs so you have scrambled eggs and coconut flour bread baked with eggs that day. Then you go back to your safe diet for 6 days and see what you notice. Rank what you experience using the scale below. Score of 1: Creates noticeable gas, bloating, altered bowel habits, fatigue, increased pain and inflammation, eczema, acne, insomnia, anxiety, brain fog, mood changes, etc. Score of 5: Moderate symptoms associated with consumption. Score of 8: Mild, almost unnoticeable symptoms with this food. Score of 10: Digests near perfectly and you feel great! The foods that digest in the 8-10 range are the main foods you want to be consuming on a daily basis. Foods that are in the 5-7 range you want to eat only on occasion. Anything ranging under a 5 should be avoided completely for another month or so before retesting again. Each month you can try a lower scoring food and see how you respond. If you are responding higher than you previously were, then you may be able to consume that food either on occasion or if it scores high enough you may be able to have it regularly. 3. Brown K, DeCoffe D, Molcan E, Gibson DL. Diet-Induced Dysbiosis of the Intestinal Microbiota and the Effects on Immunity and Disease. Nutrients. 2012;4(8):1095-1119. Thank you for this VERY informative article and video. I have RA (approx 18 years) and was on methotrexate up until about 1 year ago when I decided to forgo meds and try to manage nutritionally instead. A naturopath I was seeing wanted me to take a food sensiititvy test that would have set me back $700! We’re helping pay for my son’s upcoming wedding so that was not in the budget! I tried elimination diet a couple months ago but didn’t feel like I got any kind of conclusive results of what I might be sensitive to. This is the first time I hear of a biofeedback test I can do on myself. I am definitely going to try it. Thanks again for enlightening me. I’m loving your website! Especially love your philosophy of glorifying God through caring for our temple. God Bless! Yes, this test works well, it just takes time and great attention to detail. Let me know how it goes for you! If you are sensitive to a food, it is best to avoid it for a period of time so as to not aggravate the immune system. Unfortunately some people have severe food restrictions with this…but it is still necessary! If I decided to do the IgG testing, do i need to be ingesting the foods I think I might be reacting to? I’ve been doing some elimination and still can’t figure out what I’m reacting to, the ones I think I’m reacting to I’ve cut from my diet for a while now. Will I need to add those back in if I choose to do the blood work? No you do not need to be ingesting those foods for the IgG food sensitivity test to show a positive result to an insulting food. A good friend of mine was telling me about a food intolerance that she discovered. She is interested in finding a service to help her with her dietary needs. In the meantime, I will counsel her to stay away from these foods. Will this test work with drinks? Tea, coffee, I don’t drink a lot of coffee, but I do drink a lot of herbal teas. I have been doing the pulse test and two foods I tested the results are always 3 bpm. over. I am not getting a negative or positive response, and I tested them several times. So I am not sure if I should eliminated them, or eat them once a week instead of twice week. Love your website, and what I like the most is that you acknowledge God in your work! Hey Cathy, they may not be an issue. There is nothing wrong with eliminating them for a week or two and seeing how you feel! Sorry! one more question- can more than one food be tested in the same day, or hours apart? May God, the Great Healer, bless you for all the helpful information you give to your readers. Yes to both of your questions Cathy! mouth out after each food? Any guidance would be greatly appreciated. Yes, the key is to wait until the pulse set point goes back into balance before retesting. For most people this is a matter of minutes and it can be helpful to rinse out your mouth in some cases Barb! Based on pulse testing on some 30 food items, my system shows a positive response to nearly all (only fresh spinach and sprouted lentils scored 0/1). Today, after a month of following an elimination diet, I pulse tested a few additional foods plus repeat-tested avocado, which had been tested a month ago. My pulse response with avocado last month had increased 13 points, while today a 6 point increase (with a slight headache afterward). What may account for differences in pulse responses from one testing time to another?